Belmont alumna Bariangela Segovia and her business partner Maliyah Bass tried rolled ice cream for the first time on a Spring Break trip to New York City. After just one bite, Segovia knew she was hooked. Less than two years later, the duo has opened Rolled 4 Ever Ice Cream, the first rolled ice cream truck in Nashville, and travels all across the Middle Tennessee area with their frozen treats. Though Segovia said she and Bass were immediately interested in bringing rolled ice cream to ever-growing Nashville, they wanted to finish their degrees first. “It was a great idea at the time, but it really didn’t go any further than that,” she said. “Finishing school was the main priority at the time, and we were both interested in getting jobs in our fields. After graduating and landing our first adult jobs, we took a leap of faith.” After a few months of preparation and planning, the truck hit the road in June, rolling ice cream for its first customers. 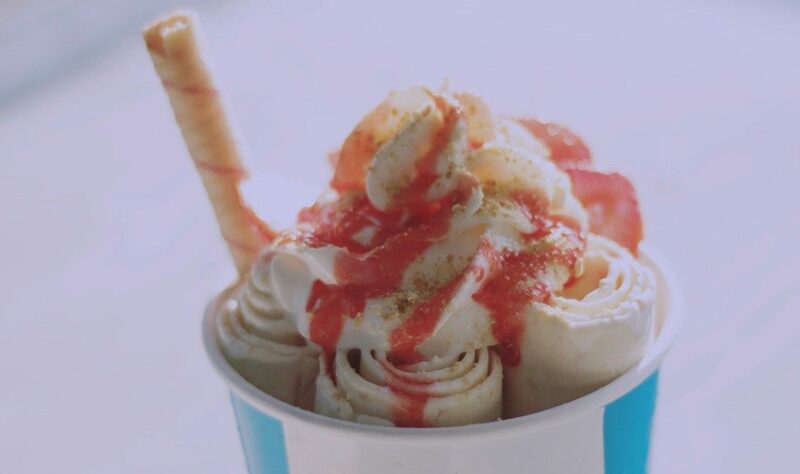 Made on a frozen slab, rolled ice cream begins as a creamy liquid before freezing and getting scraped into the rolls that gives the delicacy its name. Rolled 4 Ever offers a variety of flavors that can be customized with countless mix-ins and toppings. Segovia’s favorite? Cake by the pound — a vanilla based ice cream with a slice of cheesecake mixed in and then topped with whipped cream, fresh strawberry slices, graham cracker crumbles, strawberry drizzles and strawberry cream wafer. This creation is just one of five signature creations the truck offers customers. Though Segovia didn’t see herself as an entrepreneur while she was in school, she’s grateful for the business degree she earned as she’s been able to more easily navigate the challenges that come with starting a business. Ultimately, she’s eager to pursue her Rolled 4 Ever dreams, in addition to her full-time job, as she sees the truck becoming one of Nashville’s hot spots.